[FTC Standard Disclaimer] Certified Angus Beef is a sponsor of blog/BBQ team and this is a compensated post. May is National Burger Month and this is one of our new favorites. 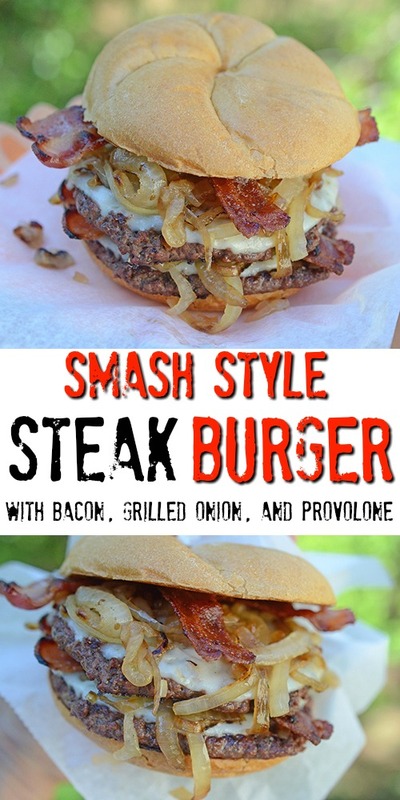 Smash style burgers have been a food trend the past several years. Essentially, you take a ball of ground beef and smash it flat on a hot flattop, griddle plate, or pan to cook it. The advantage of smash burgers is they are fast cooking and get a crispy crust. 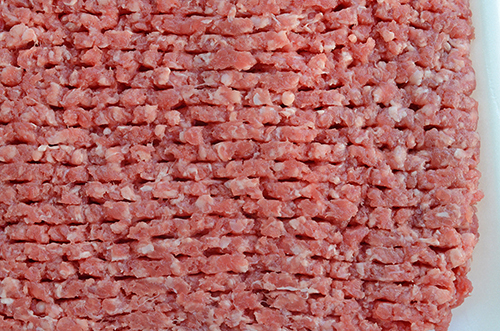 Smashburger built a chain of over 370 stores around this technique and using fresh Certified Angus Beef. We do a similar method at home that we call "smash steak burgers" because, instead of ground beef, we use cubed sirloin steaks, like you would use for chicken fried steak or country fried steak. Plus, we don't smash the burgers but they have a similar texture to the smash burgers that we have had in restaurants. Of course, we also use fresh Certified Angus Beef! Preheat a grill to 350°f. Once the temperature is stable add the griddle or skillet and allow it to preheat as well. Toast your buns. Lightly butter your kaiser rolls and place cut side down on the griddle until golden brown. Remove. Cook the onions. Lightly oil your griddle with a high temp cooking oil (e.g., canola, peanut, avocado). 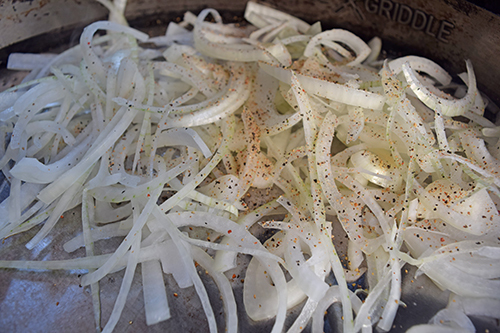 Add the onions and season with a few pinches of the beef seasoning rub. Spread them out with a spatula and let cook for 5-8 minutes, stirring and flipping them occasionally. Cook the bacon. Make room and add the bacon on the griddle, and cook until done, about 5 minutes per side. Remove the onions and bacon to a resting rack or paper towel lined plate. Grill the burgers. 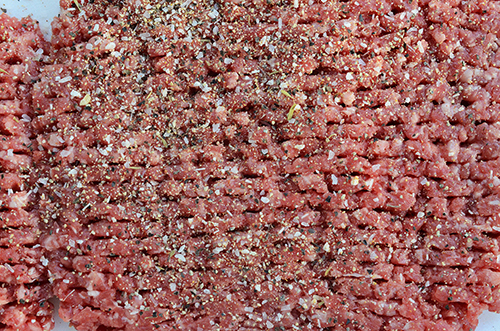 Season one side of the cubed steaks with the beef seasoning (we do about 1/2 teaspoon per burger side for the seasoning we use). Add a little oil to the griddle if you don't have enough leftover from the bacon and onions. Place the cubed steaks, seasoned side down, on the griddle and cook for 4 minutes. Season the top side while they cook. Flip and cook another 2 minutes. Top with a slice of cheese and cook until the cheese is melted, another minute or so. Build the burgers. 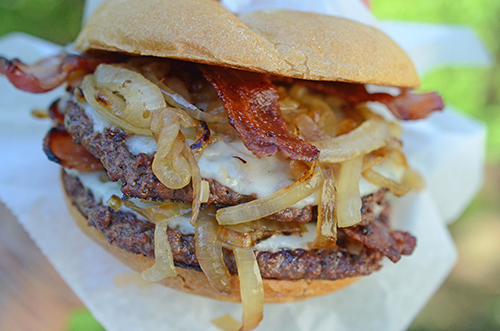 Double the stacks of patty, bacon, onions and serve on the toasted buns. Beef Seasoning Rub - We used our NMT Beef Rub V.2 but use whatever you like. A 50/50 mix of kosher salt and coarse black pepper is great for beef. We use about 1 teaspoon total per patty, but that will depend on the strength of the seasoning that you use. Grill - Sure, you can do this inside on the stove top or an electric griddle. Doubles - Add another couple of buns and you can use this same recipe for 4 singles instead of 2 doubles. Alexis bought our Certified Angus Beef cubed sirloin steaks at Food City. They were all slightly over 1/3rd pound each. I find this is a good FRESH alternative to frozen burger patties for people that don't like to mess with hand making the burger patties. 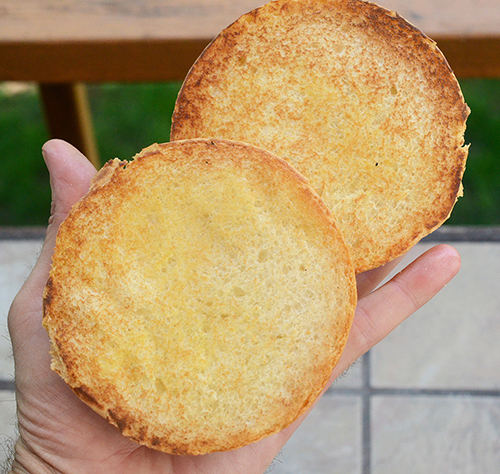 Toast your buns - it's a small detail but it makes a big difference in taste and texture with the final burger. I always like to season my vegetables even if I'm seasoning the whole dish later. First, the salt helps extract their juices and makes them cook better. Second, I like to season and taste at every step that I can. 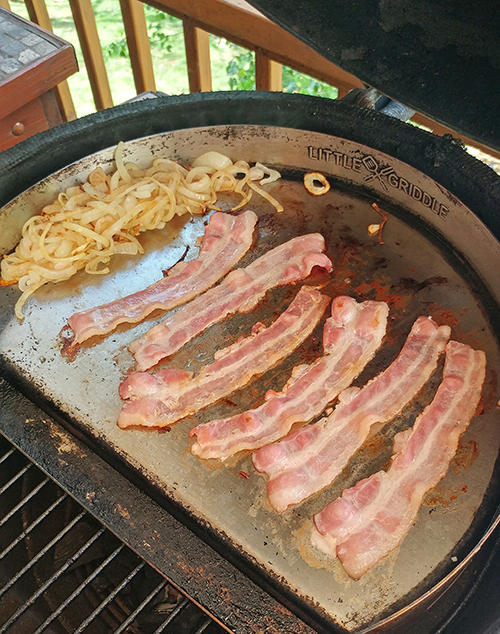 Cooking the onions and bacon on the griddle before the burgers builds flavor. 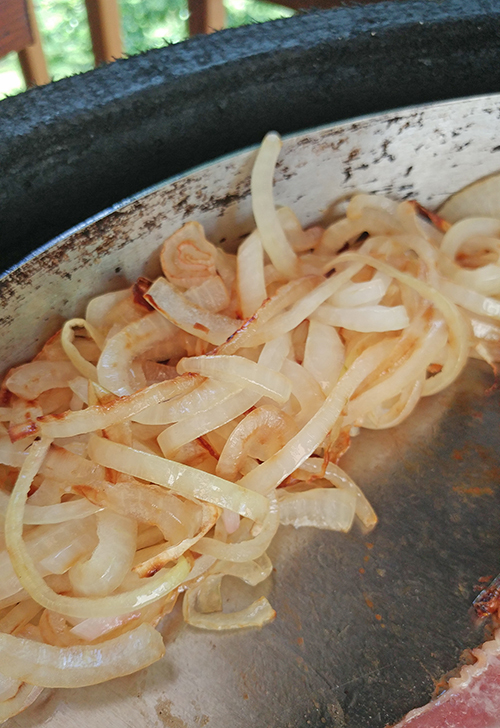 Tender golden brown onions just make a burger for me. Cubed sirloin steak is a single piece of Certified Angus Beef sirloin steak that has been run through a meat cuber, which flattens it out and tenderizes it. The little edges formed by the hundreds of small cuts get crispy when cooked on a griddle, similar in texture to a smash burger - without the smashing. Another advantage to cubed steak's many cuts is they are flavor pockets, giving your seasoning places to get into the meat and deep season it. Plus, more of the seasoning sticks with your burger this way. 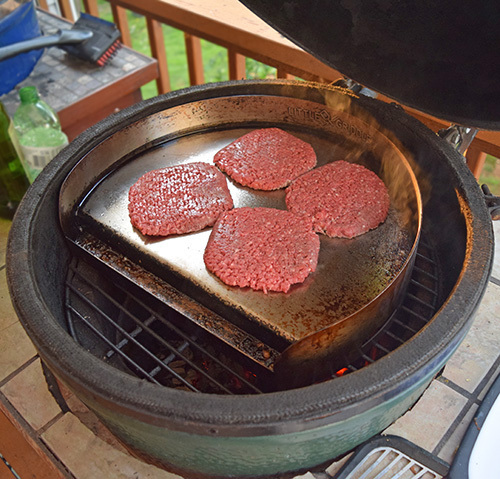 Here we are using a griddle accessory for kamado and kettle style grills. There are also rectangular versions for gas or large charcoal grills. You can also use a cast iron griddle plate for grills or a skillet. 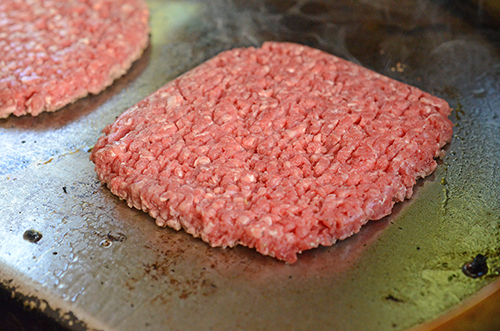 The flat surface of a griddle or skillet makes contact across the whole surface of the burger rather than just a few places where grill grates would hit a burger. This gives you that great crust. Open wide - one Smash Steak Burger coming in hot! So next time you see packages of Certified Angus Beef cubed sirloin, don't just see "chicken fried steak". Think Smash Steak Burgers and pick up a few packs! 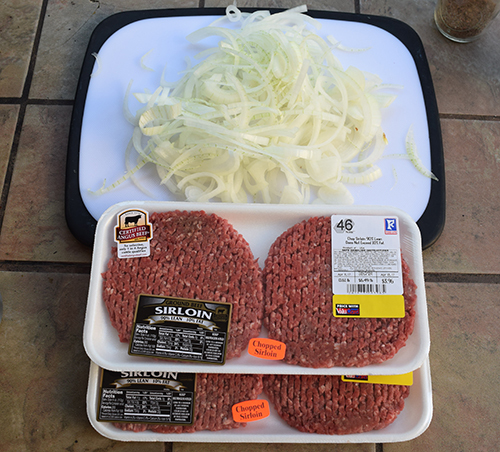 For other burger ideas, check out the Burgers section at the Certified Angus Beef website. They have the classics like Portobello Swiss Burger and Black and Blue Burger and wild ideas like the Southwestern Gambler and Prosciutto Wrapped Burger with Blue Cheese, Arugula, and Plum Ketchup.